Exploring the testing procedures, selection requirements and current issues affecting these important items of safety equipment. Anchor devices and anchor points are an essential part of a properly functioning fall arrest system. They come in many variations to suit a range of situations – the very reason why it is important to ensure that the most appropriate anchor device is chosen for the task required. It is also vital to make sure that the correct personal protective equipment (PPE) is used (for example, a full body harness and energy-absorbing lanyard) in conjunction with the appropriate anchor device. The applicable standard for anchor devices in Europe is EN 795:2012, and advice regarding multi-user devices is addressed by CEN technical specification 16415. EN 795 was originally published in 1996 to cover five classes – ‘A’, ‘B’, ‘C’, ‘D’ and ‘E’. Classes A, C and D, however, are deemed to be outside the scope of the European PPE Directive 89/686/EEC. These describe devices fixed onto a building or a similar permanent structure and, therefore, are not considered ‘personal’ protection equipment under the scope of the PPE Directive. The latest edition of EN 795 was published in 2012. One important difference in scope is that whereas the 1996 standard allows anchor devices to be permanently fixed to a structure, the 2012 version requires devices to be removable from the structure to comply. Another point to note is that the revised standard only includes test methods for single-user devices, compared with the 1996 version which offers methods for multi-user devices – that is, anchor devices that allow more than one user to be attached at any one time. This advice can now be found in a separate CEN technical specification (CEN/TS 16415:2013). There are five different types of anchor device that fall under the scope of EN 795. In some instances, anchor devices that fell within the scope of EN 795:1996 may not be within the scope of EN 795:2012. This is normally because they cannot be removed from the structure due to being permanently fixed, such as with rivets, studs, screws, welds or resin bonding. Table 1 shows the definitions for EN 795:2012. 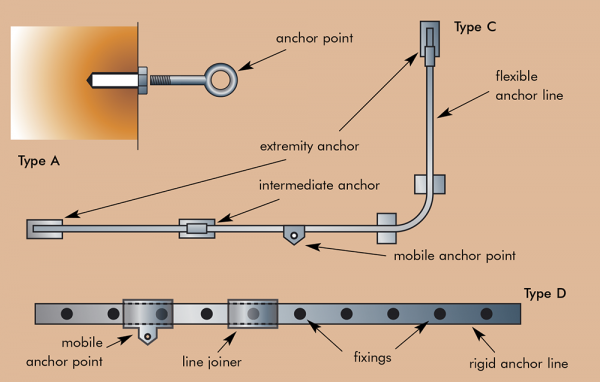 Type A – anchor device with one or more stationary anchor points while in use, and with the need for a structural anchor(s) or fixing element(s) to fix to the structure. Type B – anchor device with one or more stationary anchor points without the need for a structural anchor(s) or fixing element(s) to fix to the structure. Class C – anchor devices employing a flexible anchor line which deviates from the horizontal by not more than 15º. Type D – Anchor device employing a rigid anchor line which deviates from the horizontal by not more than 15º. Type E – Anchor device for use on surfaces up to 5º from the horizontal, where the performance relies solely on mass and friction between itself and the surface. Each of the types (or classes) indicated in table 1 has its advantages and disadvantages, depending on the situation for which an anchor device is required. Types C and D allow for greater manoeuvrability compared with A, B and E devices, as they allow the user to move quickly along a line without having to swap or move anchorage points. 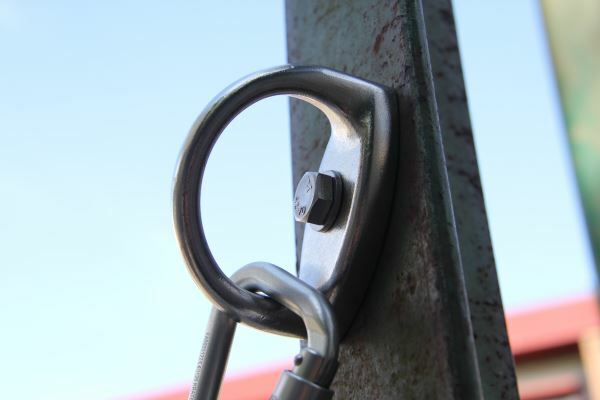 Type B anchor devices are designed to be easily transported when compared to other types, as they normally require minimal installation or can be broken down and moved quickly. Type A devices are normally small and lower cost compared with the four other types. Type E anchor devices are created by connecting multiple sections of mass to create a large deadweight and, in many cases, are designed to be used on multiple roof surfaces without the need to affect the roof integrity. a corrosion resistance test where a sample is placed within a salt spray solution for a set period of time. Other specific tests are required, including a deflection test and compatibility dynamic tests (EN 795:2012 – type E). See table 2 for complete testing requirements. Before an anchor device can be marked as compliant with the relevant standard, it must first pass all the test requirements mentioned in table 2 and in the standard for every loading direction that could occur during a fall. In situations where an anchor device requires certifying to the PPE Directive (types B and E), these test results would need to be submitted with the anchor device technical file to undergo the EC type-examination to allow for the product to be marked with the CE logo. Products which have the CE mark undergo ongoing testing and auditing to ensure that the items being produced still show the same quality and meet the same performance requirements as when the original type-testing was conducted. Where some anchor devices are not CE marked due to their type, it is recommended that the buyer/installer checks that the manufacturer maintains a similar quality system. If requested, an EC type-examination certificate and 11A /11B certificate (if applicable), test reports or quality compliance certificates should be provided by the manufacturer to show that its anchor devices are still being made to the same specification. These reports and certificates should be from independent accredited laboratories (to ISO 17025) and Notified Bodies, rather than produced by manufacturers’ in-house laboratories. Regular inspections and periodic examinations of the anchor device should always be in place to ensure that it continues to function correctly and has not deteriorated. Normally when an item of PPE is certified, the user information is checked to ensure the manufacturer includes details on this and how to maintain the product. In cases where an anchor device is not CE marked, it is advisable to acquire information, instructions, recommendations and advice from the manufacturer to be able to do this. Another consideration is whether the anchor device has been tested in the substrate on which it is required to be used. An anchor device’s performance is likely to change significantly when installed in or on different materials, and may not be safe to use without testing. In many situations, anchor devices are required for use by more than one person. This is because certain jobs need to be carried out by different people, while ensuring that everyone has the same level of protection from falling. The technical specification is PD CEN/TS 16415:2013. Most of the methods within it are the same – or use test principles from – EN 795:2012, but with more severe requirements to ensure that the anchor devices are capable of withstanding several users falling on them. The dynamic performance test requires a 200kg test mass to represent two simultaneous users. For each additional user, a further dynamic performance test using a 100kg mass is carried out on the same system to simulate multiple users falling on the same anchor device. The static strength test increases the usual single-user requirement in EN 795:2012 by 1kN per extra user claimed. As a multiple-user anchor device is not considered ‘personal’ protective equipment, it can only be certified as single-user PPE. Devices that will always be used by two or more people simultaneously do not require certifying, and it is recommended that before buying or using these devices, checks are made on the manufacturer’s quality system and that evidence is sought to demonstrate compliance with TS 16415:2013. 15 PER CENT DISCOUNT ON FIRST SATRA TEST - please click here. SATRA can test all types of anchor device to both versions of EN 795. Our test facility consists of a 5.5m drop test pit with A-frame, a 9m test tower, a large concrete area for installing anchors and a 70m length beam allowing up to a maximum of 25m single span anchor lines or up to 70m multi span anchor lines for testing. Our equipment includes a range of test dummies, load cells, test masses, corrosion cabinets, conditioning cabinets and an endurance tester. Not only do we offer testing to EN 795, but we also carry out a range of fall arrest testing to European, ANSI and Australian standards. Please email ppe@satra.com for further information on fall arrest and PPE.